Have we reached the end of the call center? Not according to Mindy Lamb at Cigna. That being said, personalization is key to keeping clients and it doesn’t happen overnight. In this interview, I sit down with Mindy Lamb at Cigna to chat about how personalization, customer-centricity and experience can lead to customer retention, thereby leading to long and fruitful relationships. 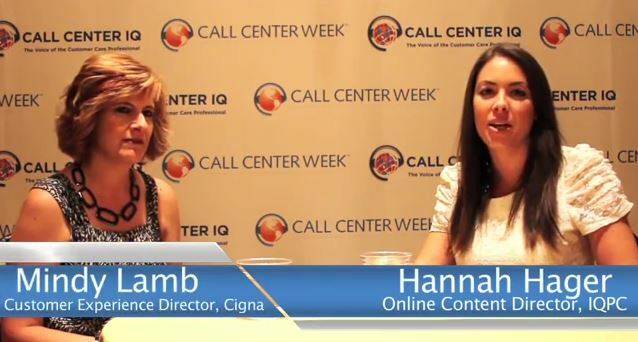 Mindy Lamb is Head of Operating Effectiveness – Customer Experiences at Cigna. Most of us are well aware that retaining customers is more fruitful than forging new relationships. Will you tell us about the customer lifetime value at Cigna? How has developing long-term relationships provided better value for customer and company alike? Customer lifetime value is an ongoing concept that Cigna and many other companies are starting to use. It’s not the only metric we use, but it’s developing and ongoing as we figure out how to leverage it better. If you think about customer lifetime value only, it really is a predictor of an individual customer’s profitability over time. So when you combine the power of that information with personal segmentation of your customers around what they need and what they value and then you understand those customers that have higher profitability projection for your company over the course of their lifetime it allows you to prioritize bringing those capabilities, products and services that individual segments of customers value the most. You’ll see higher retention where you prioritize and spend your money and investment dollars to drive that retention. Of course we benefit because their with us and they benefit because the longer they’re with us the deeper our insights grow into what they need and value so we can continue to deliver on it. Customer centricity has been redefined in today’s new digital paradigm from a B2B and B2C perspective. Are you now more enabled to use metrics to determine the value of your relationship with your customers? It’s been around for a long time. For a long time we’ve heard web to call, what’s the call rate, etc., and that’s real. If they’re going to the web to try to achieve their services and they can’t and they have to call, then we’re aware that their satisfaction scores go down. That’s one way you can look at it. But beyond that in this digital age of social media and multitudes of apps; we at Cigna try to meet the customers where they are in order to determine if they have a particular need or a interest. From there we can personalize that information within the digital space and watch to see if they react to that digital channel. We can measure what they find interesting, what they don’t and how to reach them in the way they want to be reached. There will always be a need for a contact center, but more and more in the Internet age, people like the advantage of going to digital technology to find solutions to what they’re looking for. How have you aimed to ‘retrain the brains’ of agents to find new means of customer acquisition? It starts first with technology. Once you understand your individual customer segments, what they value and what they need, then you start to understand the additional acquisition opportunities in the product that you have for that customer to find value in. The technology enables the agent to then take a client in an inbound channel and then segue into a conversation that centers around them. They can say, “I know this about you, and based on that we also have X, Y or Z, would you be interested in hearing more?” It’s really about placing the information in the agent’s hands so they know what to pass along to the customer to continue the conversations. Not all businesses have robust budgets. How can these agents create a customer experience that is five-star without all the trimmings? Particularly as it relates to the agents and what they can deliver – if you don’t have the budget and technology is a challenge for all of us – it’s important to remember that at the root of it is people serving people. The best thing you can do in that regard is focus on your hiring and retention of your employees and hire for the right capabilities. You can train individuals to be computer saavy, but what you can’t train so much, and what you’re really born with, is what I call the “servant’s heart.” You either have it or you don’t. You can hone people’s skills around being personal or empathetic, but that person’s never going to be successful at really getting to the heart of customer-centricity and helping customers if they don’t have that baseline nature. The best thing to focus on when you don’t have the five-star budget and all the wizardry that comes with it is to first start with the right people and then make sure that you incent and reward them right. Give them the power to satisfy the customer within the constraints of whatever the product or service is that you’re delivering. What you may consider as a small ability to make things right or give something back to the customer is in reality the opportunity to create both a great branding image and empowerment for our employees to know that they’re making differences every day. So hire right for the personal touch, for empathy, for people who can proactively think of creative solutions for customers and then empower them to do so.